Some of you may remember when I posted about putting in a new raised bed just outside our front door for our winter garden (it was back in October). Well, today I realized that I hadn't posted any updates about it and thought it was high time I did. I have been pleasantly surprised at how well all the seeds have done. I'm usually not very good at growing stuff from seed, but this time I did something right. Tah-dah! I do the "cut-and-come-again" method of harvesting lettuce so this 4'x8' raised planter has been providing us with WONDERFUL salad greens for about a month. And it's still going strong! It's great to have Hubby say, "I'm making chinese chicken salad. Can you go harvest some lettuce?" And I walk right out the front door with the salad spinner bowl in hand, pick the greens I want, and bring them back inside to be prepped by Hubby. Don't let all this greenery fool you into thinking that it's warm here, because it isn't. There's a daytime chill in the air and our overnight temps often dip below freezing. Lettuce and other winter greens love this kind of weather. They produce buttery tasting leaves that simply melt in your mouth. 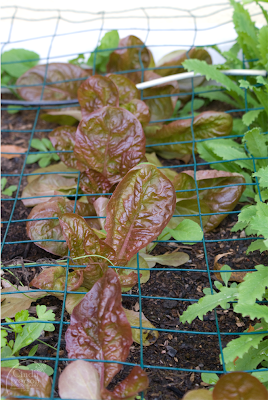 Intermingled among the rows of lettuce are other winter veggies such as broccoli, scallions, parsley, and snap peas. I also planted a row of bread seed poppies that are doing very well and getting big enough that they will hopefully bloom soon. Once they've gone to seed, we'll harvest the poppy seeds for garnishing bread and other things. I think the most exciting thing about this whole endeavor (other than the fact that the seeds grew), is that I've been able to grow everything without the use of any pesticides, herbicides, or snail/slug bait. The only deterrent I've used is some metal fencing material I had. It has kept the neighborhood kitties and other critters out of the soil. I really don't know exactly how many varieties of lettuce are growing right now. There must be at least 7-8 different ones. There were some seed packets that were mixes of winter greens, so it's hard to say. Regardless, all of them are yummy in their wholesome freshness. I wish I could share some with each of you! Wow Cindy that lettuce is beautiful! You do have a green thumb!! Wonderful kitchen garden! Now I'm inspired to work on mine! How wonderful! I need to know how you kept out the snails, though. They love my yard. I have to use bait. . . It does look so fresh and yummy...so much better than the store bought lettuce. ( I have the same problems with seeds...) What a nice Christmas surprise. Congratulations! The lettuce looks wonderful! It's amazing how much your small space is producing. Cindy, it looks great. We are growing a lot of the same things this winter. I just wish I had thought of the poppies. What a wonderful salad you've got there! Yummmy, look at all those wonderful salad greens! Looks great Cindy. I've been blogging since the first part of October, and have visited so many blogs, I can't remember if I've visited yours or not. I love today's post. I live in Nebraska, where it's currently 18 degrees F. It's been in the single digits a lot lately. 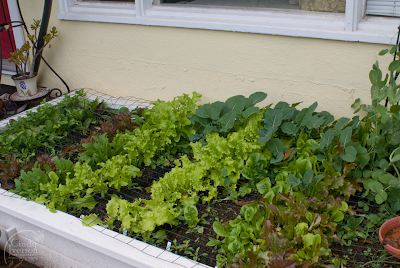 My favorite crops to grow are as many kinds of lettuces I find seeds for locally, radishes, and kale. I plant them as early as the last part of February if the soil is thawed a bit and not too wet. The last few winters have hung on, though, and I didn't get them in until the middle of March. I use Liquid fence around the garden, but not often enough to keep the rabbits from eating what they think is their share. I've noticed they really like romaine, so next spring, I think I'll plant lots of it in hopes they won't eat my other kinds as much. I enjoyed seeing your lovely crop! Cindy you got no snow, lol. Wow what a nice garden. Unfortunately, during our summer, I cannot do anything, we got Roger rabbit, skuns and some other rodens. Not sure if I want to share my food with them. Cindy, xmas is around the corner, and I would like to take this opportunity to wish you happy holidays, and all the best in the upcoming year 2009. Yeah! I love the cut-and-come-again lettuce varieties. Sadly, it will be at least February/March before I can plant any. I also have raised beds. I'm trying to make a hoop house to go over a couple of them so I can start the greens earlier. I'm also salivating over seed catalogs right now. I do great at STARTING stuff from seed but considerably less well at transplanting it all out to the garden before I kill it inside. How is it that your lettuce is so much prettier than other people's lettuce? Those lettuce look scrummy! Well done. It looks like a min Mr Mac Gregor's garden from Peter Rabbit. Well done, it looks wonderful - very envious, we had a salad bed all through summer, and I haven't planted any more. Don't forget to re-seed the bed and keep it going! Wow, look at you! I'm envious. Enjoy your fresh greens and think of me watching my toes turn blue up here in the frozen north. Oh yummy! How wonderful to be growing your own salad greens in December! OK, let me first start by saying that I LOVE my foot of snow on the ground and more falling out of the sky... BUT I am envious of those lucious salad greens just outside your front door. Simply beautiful post!! Happy holidays, looks like you'll be making some great salads with the feasts! Fantastic! I wonder if it's too late to get things started here in Oregon. After this completely and utterly bizarre snow thingy goes away, we'll have temps in the 40s and 50's through Spring. But no sunshine, is the thing. Can I get lettuce to grow in those conditions? Anyway, I just stopped by to say Happy Holidays! I hope you have a great one! Merry Christmas! Wesolych Swiat, Cindy! I am having a bit of vegetable drama these days. But this looks so good! Glad you enjoy life where you live. I may have to run screaming out of Ut to come visit you. I can't imagine a winter garden with the snow we have on the ground! Looks great!